After being mostly spared by Hurricane Harvey, The Port of Houston is coming back online today. The massive port closed Friday, August 25 at noon, and will reopen to some container ships on Sept. 1 at 7am. As it gets back up to speed over the next few days, shipping activities will be limited to daylight hours, and parts of the shipping channel will stay closed. 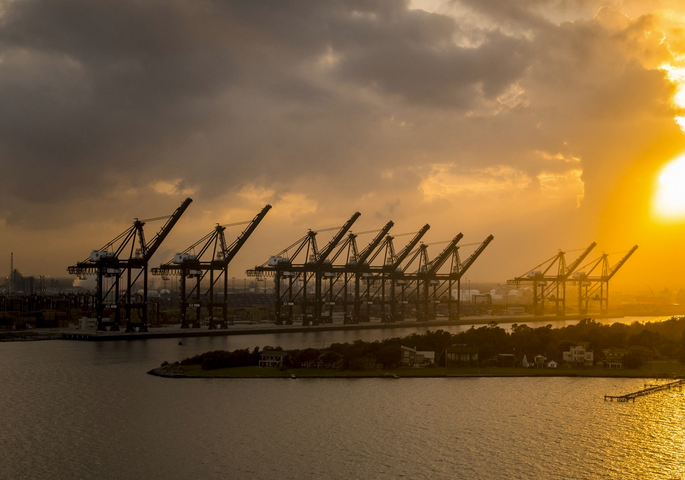 Houston’s port is the country’s second-busiest by tonnage after the Port of South Louisiana, and plays a key role in the US’s oil, gas, petroleum, and chemical industries. It is also handles more foreign shipping, by weight, than any other US port. The port’s governing body estimates it contributes over $600 billion (pdf) to US economic activity a year. The region has experienced days of heavy rains, strong winds and catastrophic flooding since Harvey made landfall Friday night. Seaports in Houston and Corpus Christi have been closed to most ships since Friday, and rising waters threaten stretches of highways and railroad tracks, bringing freight transportation to a virtual standstill. Many freight companies say they have no idea when they will resume operations. The storm is expected to linger over the Texas coast until later in the week. Even after the weather clears, it could be days before floodwaters recede enough to allow dockworkers back into ports, or trucks to resume normal routes. The storm’s impact will quickly radiate outward through the nation’s transportation network, affecting retailers and manufacturers far from Texas. Other cities could see a shortage of trucks because big rigs aren’t making their scheduled trips from Houston, and railroads could see backlogs as far away as Arizona, said Noël Perry, chief economist at Truckstop.com, an online load board. Mr. Perry said nearly 10% of the nation’s trucking capacity could be affected by Harvey, and that prices to book big rigs have jumped anywhere from 5% to over 20% after other large-scale weather events. “This may be unprecedented when all is said and done,” said Mark Rourke, chief operating officer at Schneider National Inc., a large trucking company. He said it could be three days before Schneider employees can even access some terminals in the city and potentially two weeks before normal operations resume. The storm’s impact rippled out across the region. Kansas City Southern Co. canceled cross-border service at Laredo, Texas. The city is outside the storm’s path, but the railroad had to suspend service on a key route that comes within 30 miles of the coast. United Parcel Service Inc. said it was suspending freight service in Houston and Beaumont, Texas, and offering limited service as far west as San Antonio. Union Pacific Corp. on Sunday halted all freight rail traffic bound for Houston and surrounding areas. BNSF Railway routed some freight trains around the coastal region. The railroad’s major facilities handling intermodal and automotive shipments in Pearland, south of Houston, were open but access to the sites by road was limited and train loading and unloading operations there were on hold. Numerous ships scheduled to stop in Houston, including oil tankers, cruise ships and container carriers, are anchored well outside the storm’s path in the Gulf of Mexico. Port Houston appears to have avoided major damage, but some carriers said they could be waiting offshore even after the weather clears because flooded roads will keep dockworkers from reaching the port, or trucks from carrying cargo out.